According to an extensive new report called “Sources to Seafood: Mercury Pollution in the Marine Environment,” mercury pollution near the ocean’s surface has more than doubled as a result of human activities over the last century. That mercury is largely invisible, but it becomes a human problem when it enters our bodies when we eat seafood. It is especially harmful to babies born to women exposed to mercury, causing cognitive or developmental problems. 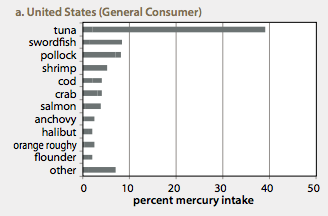 As the chart illustrates, tuna is by far the most largest contributor to mercury poisoning in humans. Americans get most of their mercury from tuna, largely because it is the most affordable option. Where Does The Mercury In the Ocean Come From? By far the greatest part of the mercury that goes into the open ocean is from atmospheric emissions, which comes from fossil fuel burning. Coal-fired power plants are the biggest source, globally. Also, on coastal areas like Maine, the Gulf of Mexico, and San Francisco Bay, much of the contamination comes from industrial sources, especially mining operations. As for regions of origin of mercury in the seas, the U.S. is not the largest contributor of atmosphere mercury. Asia as a continent now far exceeds North America and Europe in mercury pollution. Fortunately, if mercury emissions can be brought under control, mercury content of fish should go down accordingly.